The Washington Monument will receive a commemorative plaque from the people of Ireland in recognition of the long and enduring relationship between Ireland and the United States, the National Park Service announced on Thursday. The donation was coordinated with the National Park Service by Senator Mark Daly of the Irish Seanad Éireann, who is the Irish Spokesperson for the Irish Overseas and Diaspora. The plaque will be located among the 193 commemorative stones donated to honor George Washington located on the monument’s interior walls. The announcement was made on St. Patrick’s Day, the international celebration of Irish culture honoring the foremost patron saint of Ireland. The Plaque will be located inside the Washington Monument, the last being installed 34 years ago. The Washington Monument contains commemorative and memorial stones received from all 50 states; scores of fraternal and community organizations, cities and towns across America; and even 16 foreign countries. The majority of stones were received between 1849 and 1855, although the most recent new donation was accepted in 1982 (from the state of Alaska). Memorial stones are now accepted only in very rare circumstances, such as the admission of a new state to the union or replacement of a previously donated stone. The offer of a plaque from Ireland was accepted after ensuring it met proper criteria for inclusion in the Washington Monument, and review and approval by the director of the National Park Service. The presentation of the plaque from Senator Daly is targeted for this coming May in Washington. The National Park Service’s National Mall and Memorial Parks preserves, protects, and interprets the symbolic and monumental civic spaces and commemorative works in the center of the Nation’s Capital that honor American ideals and values, distinguished public figures, and military and civilian sacrifices and contributions. On the National Mall these sites include the Washington Monument, Lincoln Memorial, Thomas Jefferson Memorial, Vietnam Veterans Memorial, Korean War Veterans Memorial, Franklin Delano Roosevelt Memorial, World War II Memorial, and Martin Luther King, Jr. Memorial. National Mall and Memorial Parks also serves as a public park and open space for active civic and cultural engagement, recreation, and public enjoyment. Press Release by Mike Litterst, mike_litterst@nps.gov, of the National Park Service, U.S. Department of the Interior, Washington. The first U.S. 1916 Garden of Remembrance has been launched in Springfield, Massachusetts on 12 December 2015. Senator Mark Daly first developed the idea to mark the centenary of the 1916 Easter Rising by creating Gardens of Remembrance in villages, towns and cities throughout the country. With the help of Diarmuid Gavin a garden design concept to be replicated was created. Since the launch of the project in 2015 over 20 gardens have been set up across Ireland, a figure which is increasing. The project has been a huge success and has been adopted by our counterparts in the U.S. to commemorate the men and women who dedicated their lives to fight for Ireland. United States officials including U.S. Rep. Richard E. Neal, Mayor Domenic J. Sarno and Vice Consul Meg Laffan of the Consulate General of Ireland in Boston took part in the groundbreaking ceremony in Springfield, that coincides with the 100th anniversary of the Irish Easter Rising. The garden will feature seven newly planted oak trees to represent the seven signatories of the 1916 Proclamation. In addition, there will be a life size typographical replica of the proclamation and flag poles with the tri-color Irish flag and an American flag, according to the design. Comments Off on First 1916 Garden of Remembrance opens in the U.S.
On 23rd Sept 2015 Senator Mark Daly spoke in Seanad about the political instability in Northern Ireland and highlighted how the lack of engagement by both governments was effecting the daily lives of the Northern people. I am disappointed with the final vote of Tá 21 Níl 24 in the Seanad yesterday evening. 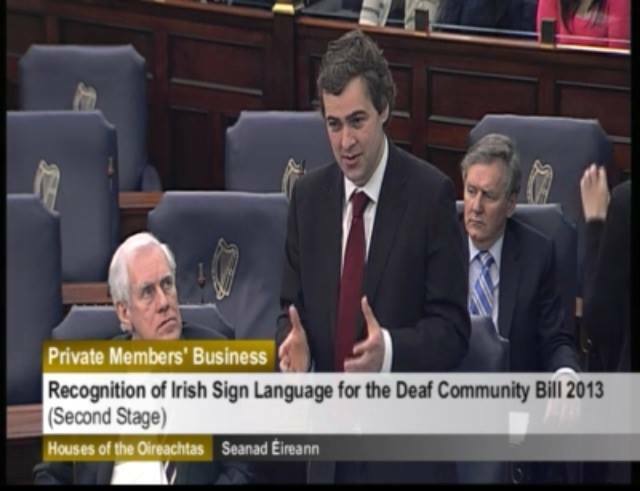 I will continue to work on the issue of the Recognition of Irish Sign Language as I feel it is an important matter. 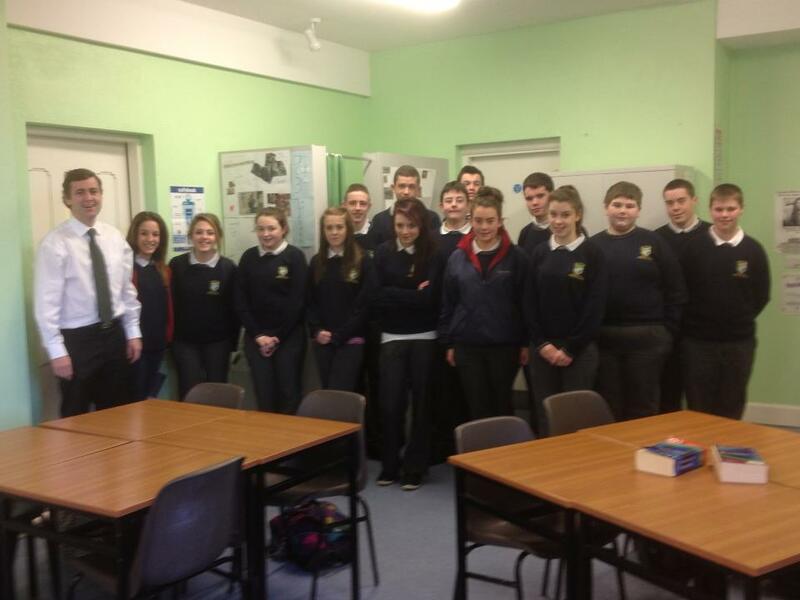 Today I met students of Pobail Scoil Inbhearsceine to discuss the Dáil and Senate before their visit next month. They posed some tough questions.